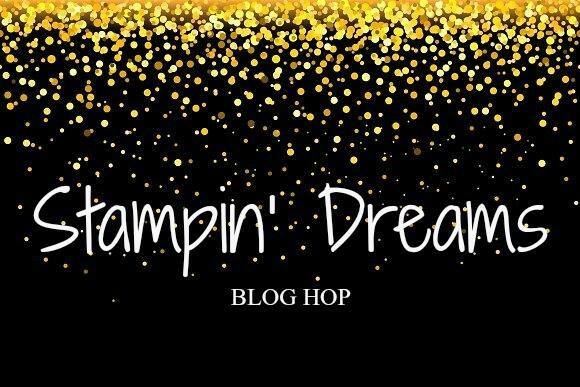 Well my lovelies.... it is time to hang up my Stampin' Up! hat. Thank you so much for checking out my blog and and those of you who have enjoyed my creations and have left lovely comments. 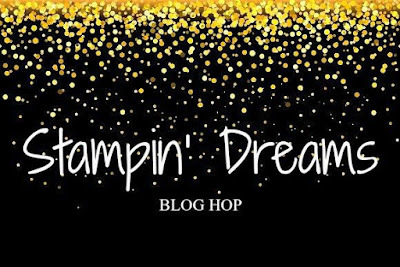 I will still be crafting for myself, but I will no longer be an Independent Stampin' Up! demonstrator. May and June where the most awful months for me with sickenss and losing someone dear. 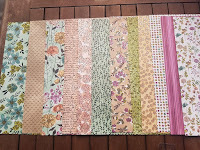 I don't know if you are like me, but I simply cannot craft and create when I am so sad. When I start to recover I feel my smile come back in my craft and this card is my reflection of that. I wanted to make a simple clean card which can be used for any occasion or just a note card. 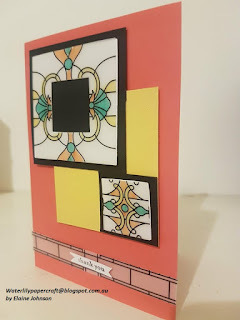 This was not a card I entered into a bloghop, but I did decide to shared on my blog and facebook purely for inspiration. 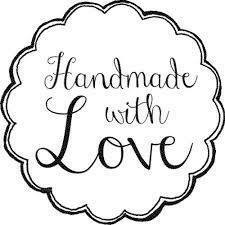 Thank you for stopping by ...... and it is so true when the say "craft is a therapy". 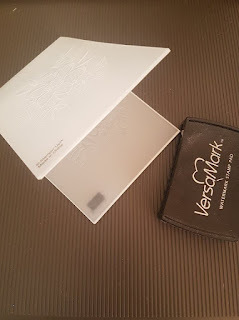 This was the first chance I have had to have a play with this beautiful embossing folder. 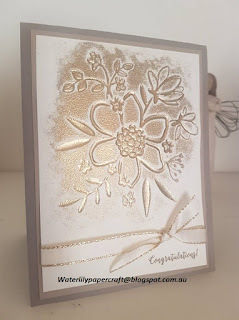 It gives an amazing deep impression into the card which gave me the idea of heat embossing. 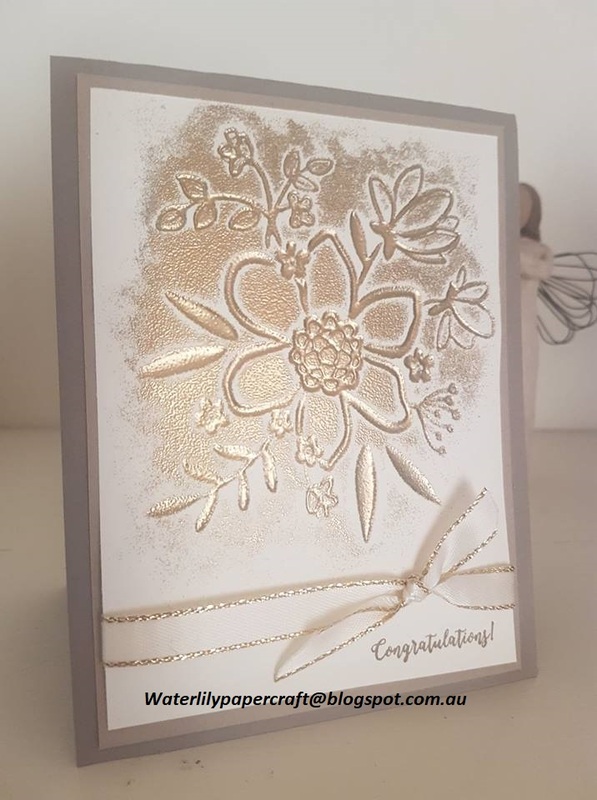 I used the Versamark on positive image, and heat embossed in gold embossing powder and it came out beautifully, so I thought I would see how it would turn out on the negative image and I absolutely loved it even more! 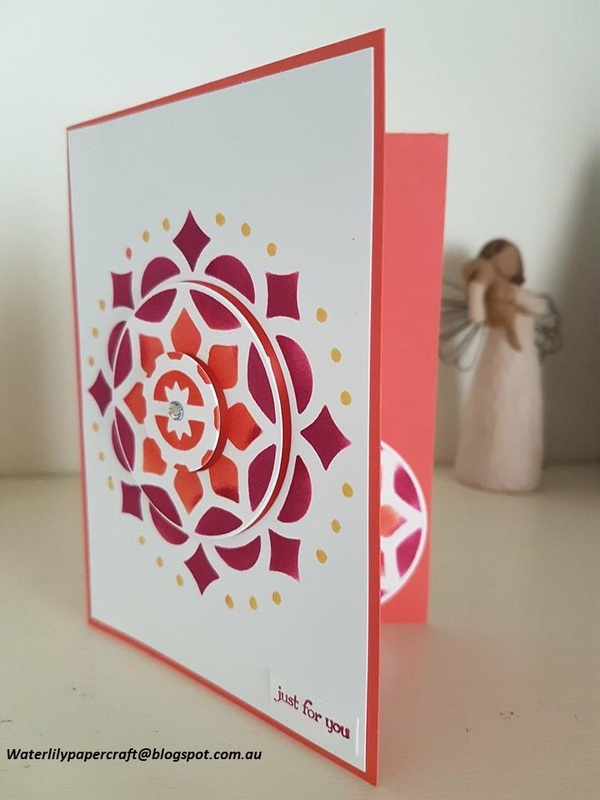 If you live in Australia and would like to order any of the products used to make this card, please press the shop button and they will be delivered directly to your home. This little box was inspired by a project I made from approximately 3 years ago when I started crafting using SU products, which was published by Pootles Papercraft. I have changed the measurements slightly as I am using the new DSP instead of cardstock which will make two of these little boxes/bags which are ideal for putting a little gift inside etc.. chocolates, lip balms etc.. 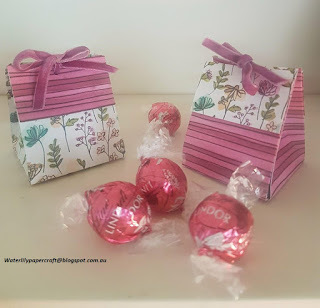 I can easily get in three Lindt chocolates in my ones today. 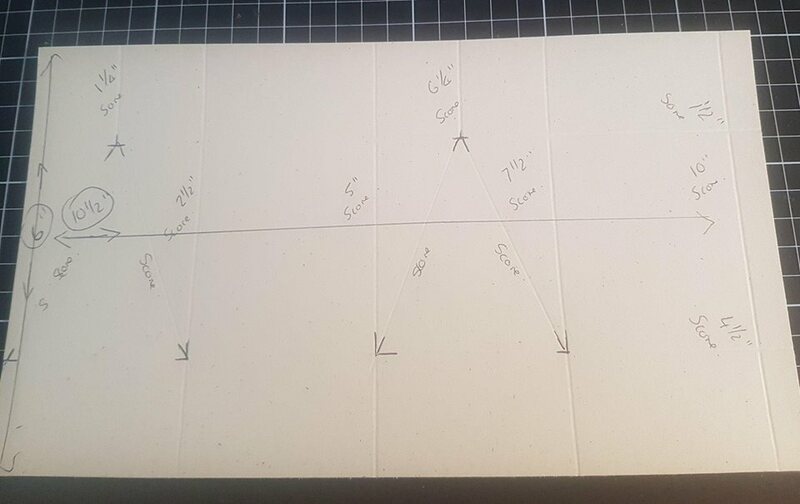 I have taken some photo's of my prototype with the measurements which you can see below. 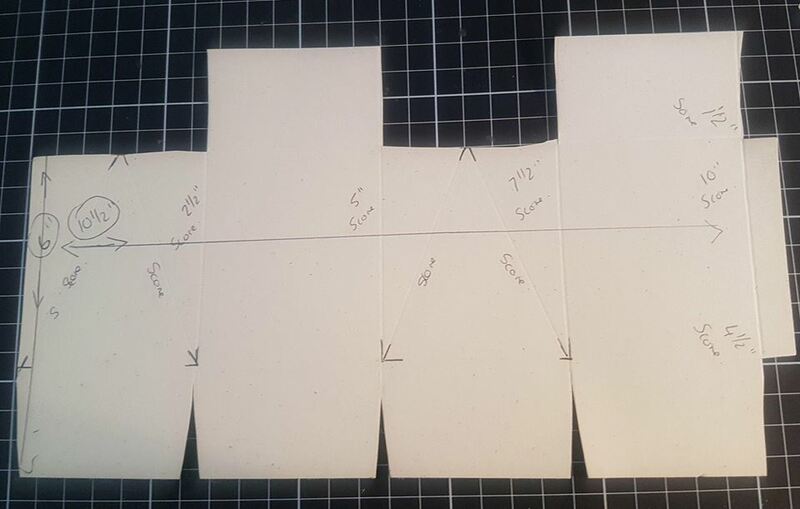 Using 12 x 12 DSP, you will need to cut to the DSP in half = 6" and then turn and cut 10 1/2". You can get two little boxes out of one sheet. 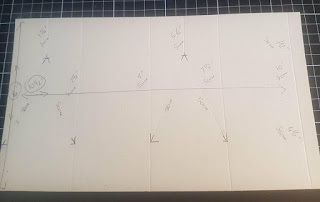 If you are using a DSP where the pattern is facing a certain way, be aware of where the top of your box will be and face your pattern accordingly. Score at 2 1/2", 5", 7 1/2" and 10"
Turn around to the short side and score 1 1/2" and 4 1/2"
Then cut away as shown. 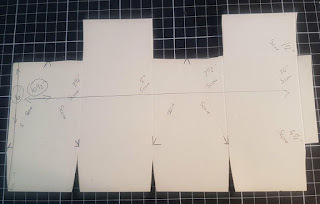 Fold and glue the bottom of the box and fold back the two top flaps to show the opposite side of the paper and gentle push the tops together which will allow the sides to naturally crease where the score lines are. Punch holes on each side and feed through a ribbon to tie. I hope you can follow these instruction, otherwise hop over and subscribe to my YouTube channel and you will see one being made very soon, be sure to press the notification button so it will alert you. If you LOVE this DSP as I do, it will be available to order June 1st 2018 from the new 2018-2019 catalogue, so if you live in Australia and you would like to go onto the waiting list for this product or you like a copy of the new annual catalogue, please send me a PM. 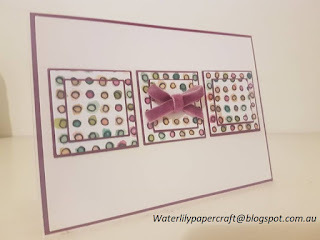 This was such a therapeutic card to do, but it would also be also fun to do together with children or grandchildren. With old washi tape I taped the Mandala mask down over Whisper White cardstock being careful to centre. Gently daubing the ink over the areas with each colour. I wanted a dark intense colour so kept building it up. If you want a lighter shade then just lightly dab. I found when I got to the small dots then it was difficult with the dauber as the colour kept going onto the next section, so I changed to a blender pen which was better. I then placed two circle dies in the area of the Mandala I wanted raised and then ran through the big shot. 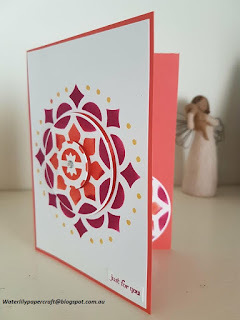 I glued down the base onto Calypso Coral card and with the largest die cut circle I placed Dimensional's (two stacked on top of eachotherr on three sections behind he circle) this raised up the first circle. With the middle circle die cut I placed four Dimensional's in the centre of the circle behind to raise it up further. To complete I placed a Rhinestone in the centre. 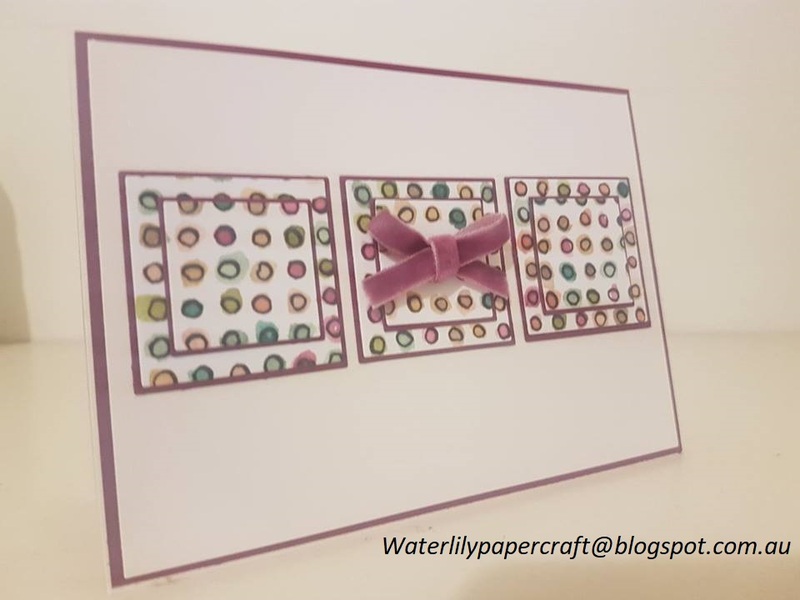 Listed below is what I used to make this card. If you would like to order any of the products I used and you live in Australia, press the shop button and copy and paste the codes. Hope you have fun, ENJOY!! 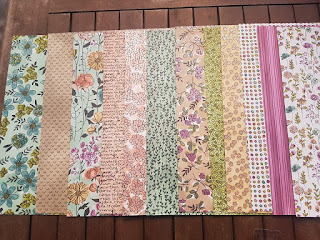 I treated myself to the pre-order "Gotta Have It All Bundle" (149812) which is now open to customers to order. The suite has EVERYTHING I LOVE in there, so I could not resist. I wanted to cover the front of my Memories & More album (code 144203). The papers are to die for .....the photo's you see do not do this paper justice, you really do have to see them in real life to appreciate the pearl design and the feel of the paper is just top quality. 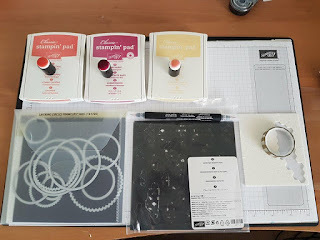 I had trouble choosing one of the papers for the front cover of my Memories & More photo album as I love them all.... so I looked for inspiration from the Share What You Love Embellishment Kit Designer box included in the suite which has Stampin' Up! Statement of the Heart on the lid which is beautiful. The paper matches closely to the box and I thought it would look lovely as gift set. 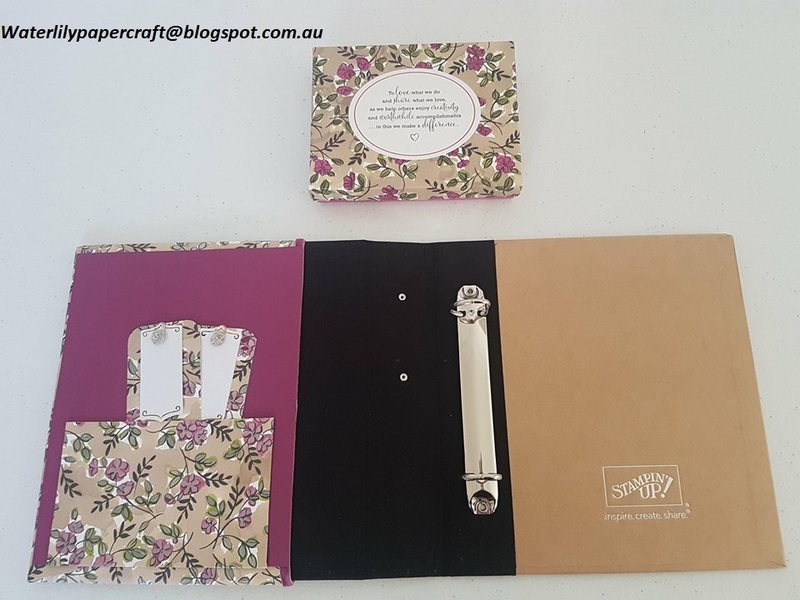 I also had enough of the 12"x12" paper left over to make a little pocket on the inside and two book marks using some of the embellishments from the little kit. The measurement are listed below. Cut your chosen paper to 8"
Glue to the front of the album lining up with the black material on front of the album and wrap ends to the inside of the cover and glue down with a good quality glue like Tombo. 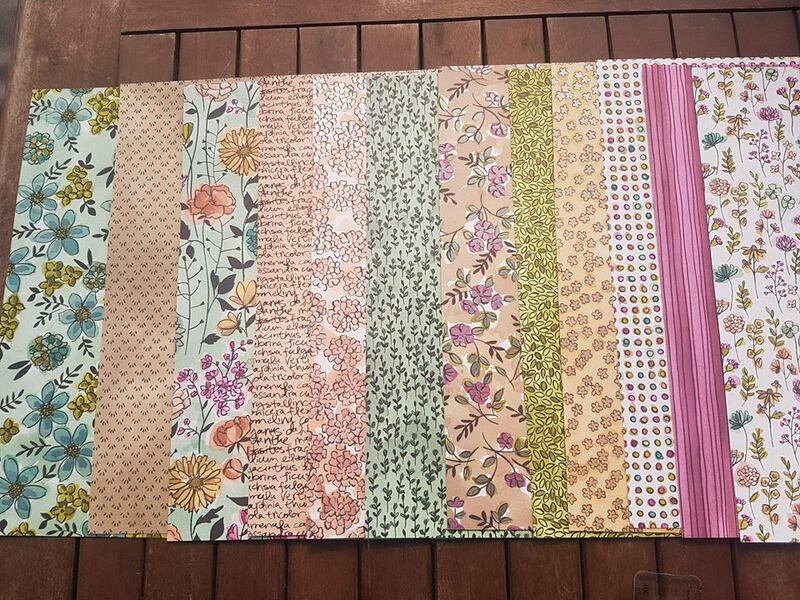 If you want to use a ribbon how I did, then wrap around the front cover and glue on the inside as this is going to be covered by card. I lined mine up with the black material to make it look neat at the front. Press it all down firmly so the glue will hold. 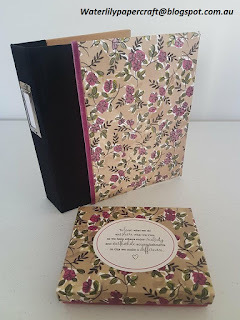 I used the matching cardstock in the suite which is Rich Razzelberry for the inside of the cover . 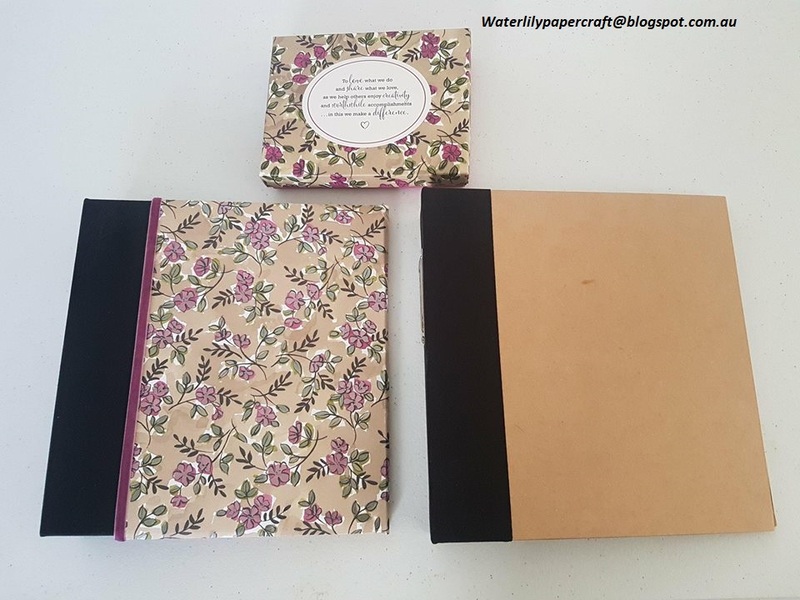 I measured this to 6 1/2"x 8 1/4" and glue on to the inside of the cover which covers the folds and the ribbon join and tidy's it all up. Optional: With the remaining DSP I measured 6" width 3 1/4" length and scored 1/4" on three sides. Fold back where it is scored and glue on the inside to make a pocket. I then had the last of the paper which I cut to approx. 5" width and rounded the edges attaching a couple of the embellishments from the kit to decorate. I hope you can follow my instructions, but if not I will be covering another of my albums so if you would like to see my YouTube video replicating the above instructions please subscribe to my channel so you can follow the instructions step by step. Everything I used is the suite. If you are in Australia and you would like to order this special pre-release to the 1st June 2018 catalogue then you can press my shop button, copy and paste the code: 149812 and you will have it all too!!!! If you would like to have a copy of the new catalogue, please send me a message. Hope this project has inspired you.